P0130 – P0177- These codes have to do with your O2 sensor. This sensor measures the oxygen in the exhaust, which then tells your car’s computer whether it needs to inject more or less fuel. P0440- This well known code is often caused by a loose fuel cap. The first thing to do is tighten your fuel cap. A loose fitting fuel cap can cause gas to evaporate over time. P0171 – P0174- This code will be triggered when the catalyst monitor finds a drop in the catalytic converter’s efficiency. This is one code that can mean an expensive fix; it can also mean that there may be other underlying problems with your vehicle. P0300 – P0312- These 12 codes have to do with your ignition coil. The number that follows the P030 code represents the number of cylinders that may be misfiring. A bad ignition coil may not be the only cause of the misfiring and it could be an easy fix such as a bad spark plug, or it could be something more serious. P0101- This code relates to your mass airflow sensor, this sensor meters incoming air and decides how much fuel to inject. You car’s fuel efficiency can decrease greatly when there is a problem with your mass airflow sensor. P0401- This code relates to the EGR or Exhaust Gas Recirculation Valve in your car. If this code is scanned, it is likely that you have a bad valve. A problem with your car’s ERG valve could cause your car to idle roughly and your engine to be choppy. P0217- This code will light up when your engine is overheating. This light should come on prior to any damage being done to your engine. Your car may also trigger this code if you are low on coolant. P0463- This check engine code can be triggered by the fuel level sensor, which is found in your car’s fuel tank. If a problem occurs in your gas tank, it will trigger this code. P0115- Triggered by the ECT or Engine Coolant Temperature sensor this code may show up if the PCM or Power Control Module is detecting a voltage condition that is too low or high. A vehicle with this problem may be hard to start, smoking or backfiring. 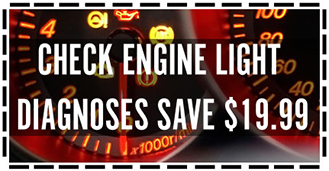 With one simple tool you can answer the question, “why is my check engine light on?” You may even discover that it is a simple problem that you are capable of fixing without the help of a mechanic saving you money and potential worry.